New York, NY: Baen, 2017. Signed limited edition. Book is in fine (unread, still in publishers shrinkwrap) condition without a dustjacket as issued. An Attractive Copy! Please feel free to ask me for pictures or more information, Thanks. . Special Limited Edition. Full-Leather. New. 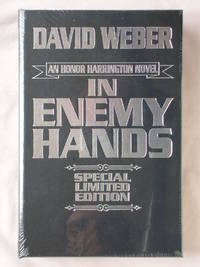 In Enemy Hands is a military science fiction novel, the seventh in the Honor Harrington series by David Weber, and was first published in 1996. Like most novels in the series, its text is available in the Baen Free Library.